Caley Hicks had the honors of designing up some Halloween treats for us this year. I’d say, she succeeded in tempting my Vinylmation sweet tooth. There will be two to choose from this year. Both are Limited Release that will go up for sale on September 20 in the parks and online for $14.95 a piece. First up is Vampire Stitch. The Mayor Scarecrow that sits in Town Square each and every Halloween season. I can’t tell you how much I love walking around the Magic Kingdom when it decorated for Fall, and these scarecrows are a huge part of that. I have always wanted to see these in a box set or put into the Park series, but this is a great way to get at least one of them out. Great looking suit and sash. The grass drawn in around him is the perfect touch! The Stitch design is one of the best to capture the real Stitch so far, but he doesn’t excite me as a Halloween design. 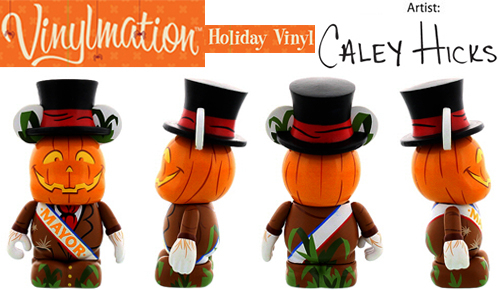 Caley should have made his medallion look like a pumpkin or given him a pumpkin Haloween basket accessory. That said, I LOVE, LOVE, LOVE the Halloween Mayor!! Classic MNSSHP material. Gotta have him, for sure. The scarecrow vinyl takes me back to trips to the World during MNSSHP time — great choice. I was really hoping we would get Mickey dressed in his MNSSHP outfit though to go with the Minnie we got last year. These must be fun figure for Halloween 2013.